Feeling Fictional: FairyLoot Unboxing - July 2017 "Tricksters"
This was my third FairyLoot box and I hate to say it but compared to May and June I was actually disappointed with this one. I still think that FairyLoot is by far the best UK subscription box out there and I'm looking forward to receiving the August box but this one just didn't live up to my admittedly high expectations. As always I'm going to assume that if you're reading this you either already have your box or you're happy to get spoilers so reading beyond this point will show you everything that was included. 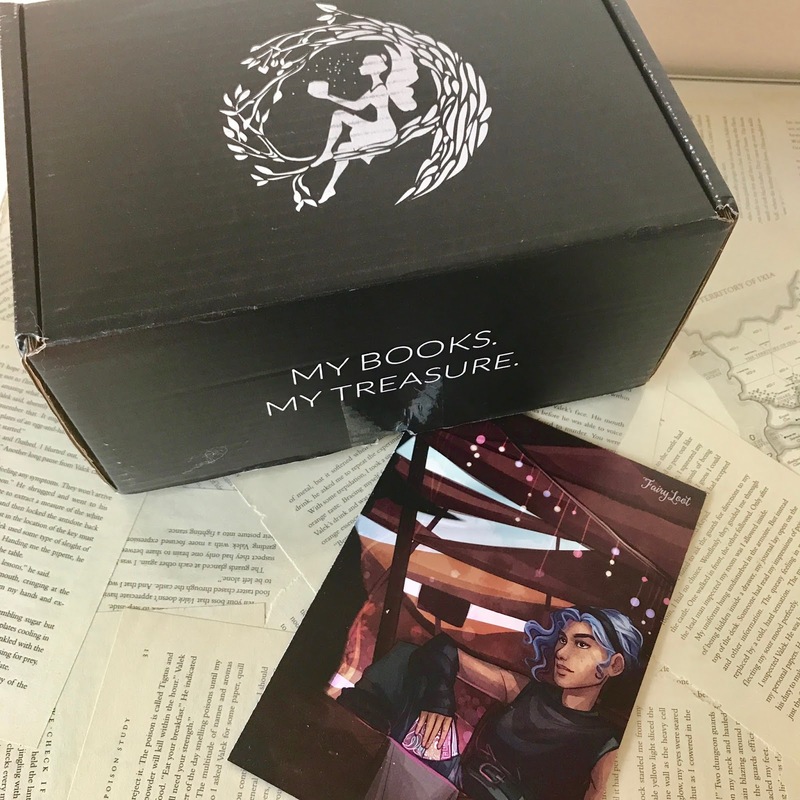 I think the book is the most important part of any subscription box and I'm glad that Fairyloot include enough clues for people to figure out what book is included if they want to. Personally I'd rather know what book I'm getting to make sure I don't end up buying it twice and luckily my guess for the July box was correct and I love that you also receive a signed book plate and a letter from the author. 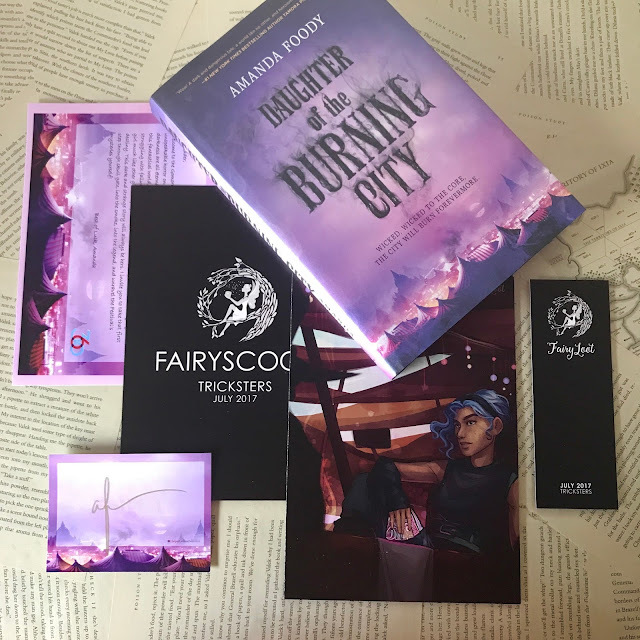 The book received this month was this gorgeous hardback of Daughter of the Burning City by Amanda Foody, I've already read it (watch out for my review coming soon) and it was a really fun read set in a travelling carnival full of mystery, murder and mayhem! Definitely one to look out for if you've not already bought it. The first item in the box was an exclusive Sherlock Enamel Tin Mug by Fictiontea Designs, you can never have too many mugs and I love Sherlock so even though I don't love the design I'm happy with this item. Next up was Loki Body Lotion from Geeky Clean it smells lovely but I'm not sure exactly what the scent is. I doubt I'll actually use this product because I have really sensitive skin and tend to come up in a rash if I use scented products but I wish I didn't have that problem! 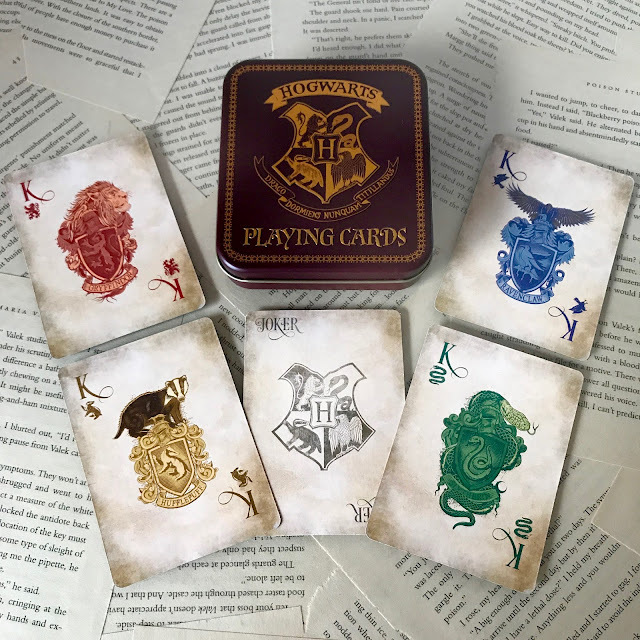 My favourite item in the box by far was these Hogwarts playing cards, each suit is one of the Hogwarts houses and I totally love them. Unfortunately my tin arrived dented and scratched though which was a little bit heartbreaking but these are definitely going to be my go to playing cards from now onwards! The next item was definitely the most disappointing thing in the box - a Fortune Telling Kitchen Glove. I can't even begin to tell you how upset I was when I pulled this out of the box, I know FairlyLoot said they were including items that they'd never seen in a subscription box before but I'm pretty sure there's a very good reason for that!! I mean seriously, who the hell buys a bookish subscription box hoping for an oven glove? It don't know about anyone else but I use 2 hands to get anything out of my oven so having a glove for one hand makes it useless as well as the most boring subscription item EVER and it doesn't even make a good photo prop so it's definitely not something I'd have chosen to spend my money on. I don't even care that it has a cute pattern on it, that material could have been used for pretty much anything else and I'd have loved it but an oven glove.... I'll get over my disappointment eventually I guess LOL. The next item was this Exclusive Harley Quinn Print from Miss Phi, the quote they chose and Miss Phi's design are both lovely but I've never seen Suicide Squad so I wasn't particularly interested in this one. I'm also not a huge fan of prints, purely because I have so many of them now that I couldn't possibly display them all so they all end up shoved into a draw and forgotten about. I guess if it was a quote from a series I loved I might like it more but this one doesn't have much appeal for me. 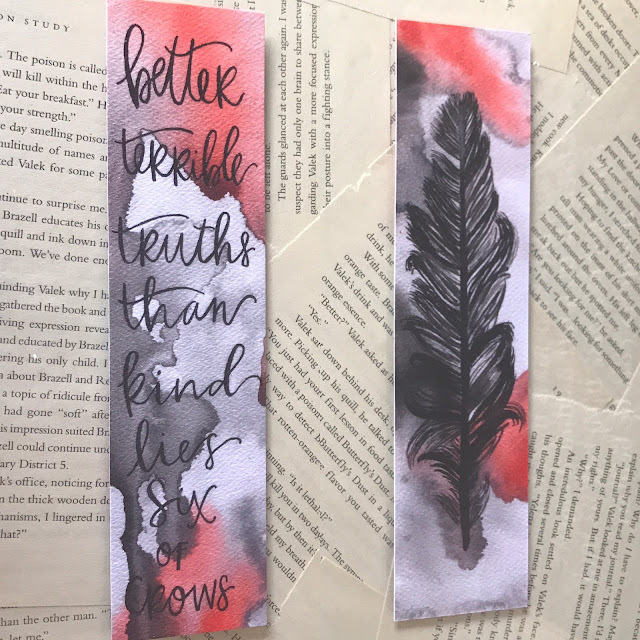 The last item in the box was a Six of Crows inspired bookmark from Lexy Olivia, this is actually for sale in her etsy shop so if you missed the box you can still buy one. I'm a huge Six of Crows fan and I collect bookmarks so this is a great addition to my collection. (Note: I only received one bookmark but I stitched two photos together to show both sides of it here). So that's all the items individually, lets have a look at the whole box together. Like I said, not my favourite FairyLoot box so far but I'm hoping the August box will be back up to the usual high standards. Do you like buying subscription boxes? What do you think of this one? What box is your favourite?